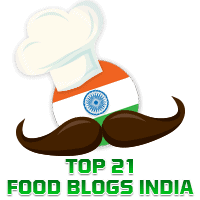 My aim is to broad base my blog, over time, with a variety of dishes, made and enjoyed not only by me, but also by friends who contribute guest posts. 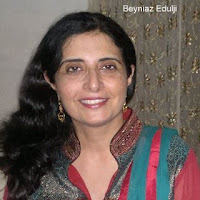 My friend Beyniaz Edulji is well-known for her articles on travel and cuisine. 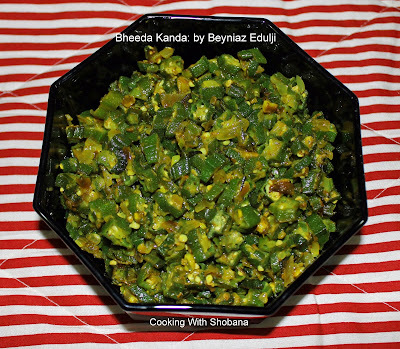 When I asked her to contribute a guest post, she gladly agreed and we have today her recipe for a dish made of okra and onions, called Bheeda Kanda. Wash the Okra and dry. Cut into thin slices. Finely chop the onions. Heat the oil in a large frying pan. Add the onions and fry. Add the ginger garlic paste and cook for another 2 minutes. Add the chopped chillies, Chilli powder, Salt, Turmeric Powder, the Coriander and Cumin Powders and sauté on low flame for another 2 minutes. Add the sliced Okra and mix well. Cook uncovered till the Okra is cooked. Add the Garam Masala and green coriander. Thank you so much, Beyniaz. I am sure many will enjoy this dish.